Below is the information for Saturday's Parade. Please make sure your student takes their instrument home on Friday. Please Find Below Information on our First Parade. PARADE START IS AT 9:00AM!!! Meet no later than 8:30 AM at the parking lot on the corner of Tabernacle and 200 West. 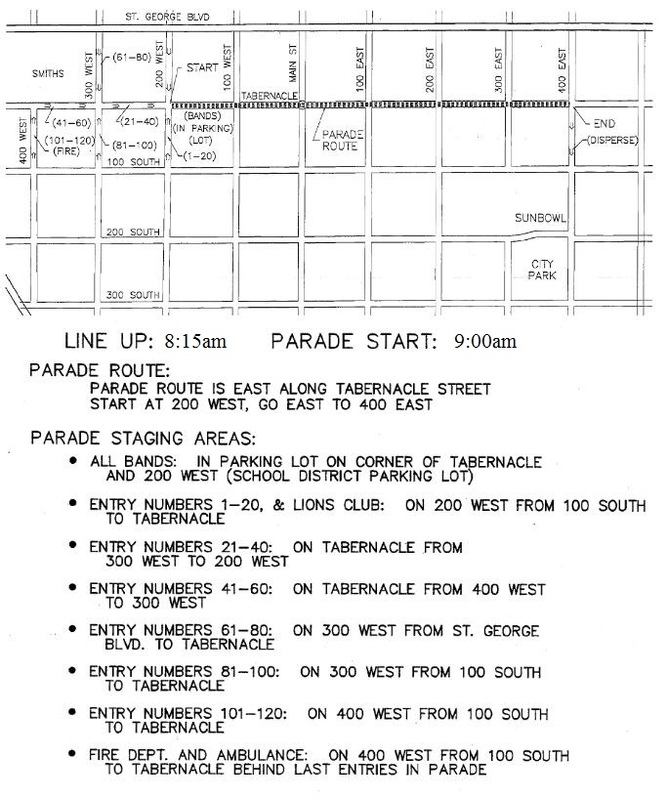 Parade Route: Begins at 200 West and Tabernacle, and travels East to 400 East Tabernacle. Please get your student close but be aware that Tabernacle to the East is always very congested. The Sunbowl on 400 East and 100 South is a good place to meet your student at the end. Band T-shirts - EVERYONE MUST HAVE A BAND T-SHIRT These will be handed out in classabout one week before the parade. They will be $10.00. Please pre-pay at the bookstore or front office and bring me the receipt. As you were informed in the band handbook, the uniform for this parade will be the SCMS Band T-shirt with Black shorts, Grey or Black shoes. Please come as close to this as possible. With the exception of shoes in a few individual cases, the uniform will be strictly enforced. Failure to comply may result in you not being allowed to march in the parade and a zero for your grade. Great marching bands not only sound good, but also look good--please help us in this. All students are responsible for bringing their own instruments and equipment to the parades. (This includes percussion, banner carriers, color guard, and school-owned instruments). Do not bring any cases to the parade--there will be no place to put them and you can’t carry them with you. Only bring your instrument. Be very careful with it. If you happen to forget your instrument or need to pick it up, I will be at the school Friday until 4:00 PM. Please e-mail asap with any other emergencies. Each parade will count 100 Points toward your performance grade. Points will be deducted for playing out of turn and/or doing anything that would be a bad representation for SCMS--remember, you are representing the school and your community--your best is expected. Please be early and on time. When you arrive, check in with the parent volunteer with the blue clipboard, so you can receive credit for being there. Please be on time. Thanks for all your hard work. Have a great performance!! FYI : OUR NEXT PARADE IS SWISS DAYS IN SANTA CLARA Sat. Sep 22nd in the morning.